It was almost time for him to come home, but I was nowhere close to starting dinner preparations. I had to take her to the children’s park but I was in no mood albeit she was feeling crabby and needy. I wanted some fresh air too, more so to be by myself. After a brief phone call and half an hour later he eventually made it home, picked her up to the park and I, refused to go. He suggested we go out for dinner, but knowing me, I turned that down too. I prefer home-made, I said. After pondering for a good 15 mins, I dragged myself to the kitchen and scrambled through the refrigerator. 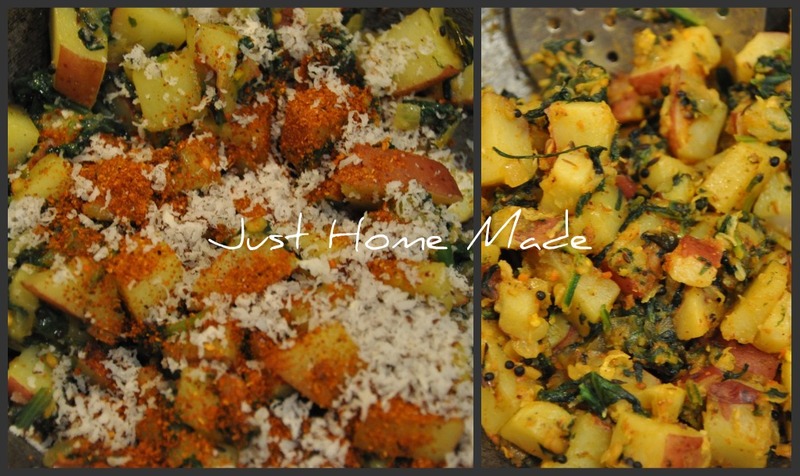 Potatoes, Spinach, lemon and some Nalgari powder, neighbor Maami* gave me the other day! Was it the bulb in the refrigerator or the light bulb inside my head? And quickly, I was out of my blues and into cooking the green. 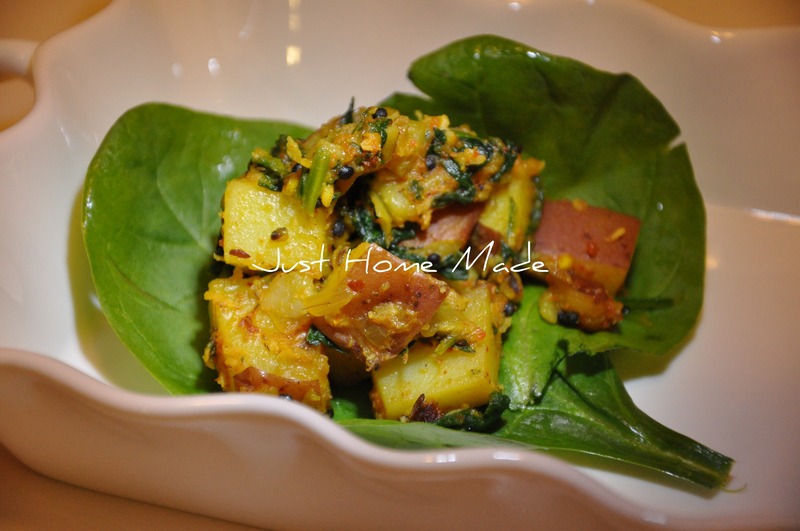 The very thought of Aloo Palak immediately fills me with a whiff of Garam malasa and a mild aroma of cumin seeds. Unlike that, this one tells the tale of a blend of spices so south Indian, hence named that way. It is inexplicable just how heavenly it looked to my eyes. Almost like in the movie Ratatouille, how the critic is flown back into the memory lane, the first bite of it took me right down to a Darshini* in namma* Bengalooru, to the taste of the Potato palya* on Masala Dosa, a taste you can only taste in hotels (as it is called there), comforting me like no other. When Maami handed me the Nalgari powder, I seldom imagined that I could use it to rouse such a nostalgic taste. Anyways, here’s the finger licking good recipe for it. I’ve used red potatoes and I keep the skin as it adds so much to the visual appeal apart from its taste and nutritional benefits. Microwave the potatoes in a bowl of water covering them for 5 mins or until semi cooked and let cool. Dice the potatoes when cooled. Heat oil in a medium size kadai or skillet over medium to high heat. Add in the mustard seeds and let splutter. Add in the methi seeds, urad dal, green chillies and hing in that order. When the urad dal turns golden brown, add the turmeric and onions and sauté until onions turn translucent. Sprinkle in the salt, Nalgari powder and Kobri and stir well. Switch off, squeeze in the lemon juice, mix well and serve hot with Chapati, Roti or Puri. Alternatively, the potatoes can be diced raw and cooked in the skillet till done. Microwave method reduces the cooking time in half. It looks delicious! I saw your blog from the foodie blog roll and I like what you have here.if you won’t mind I’d love to guide Foodista readers to this post.Just add the potato widget at the end of this post and it’s all set, Thanks! Hope you’ll find more recipes of your interest here. 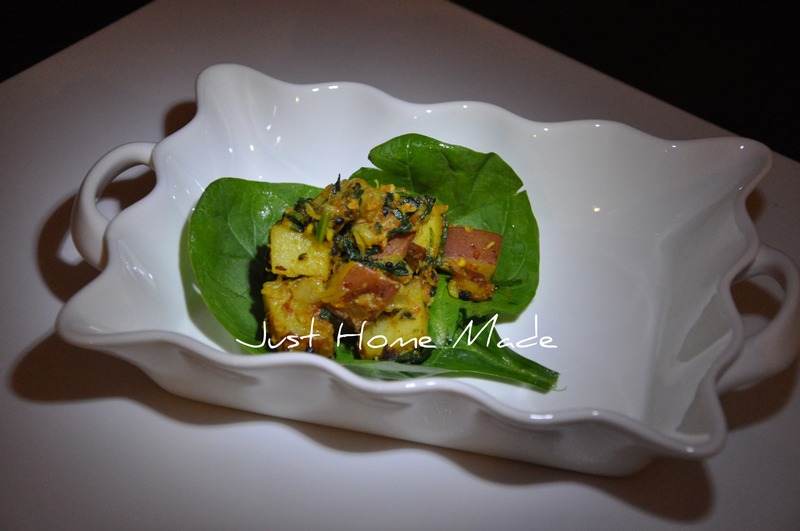 I like the addition of spinach to this dish – makes it an easy way to eat spinach. 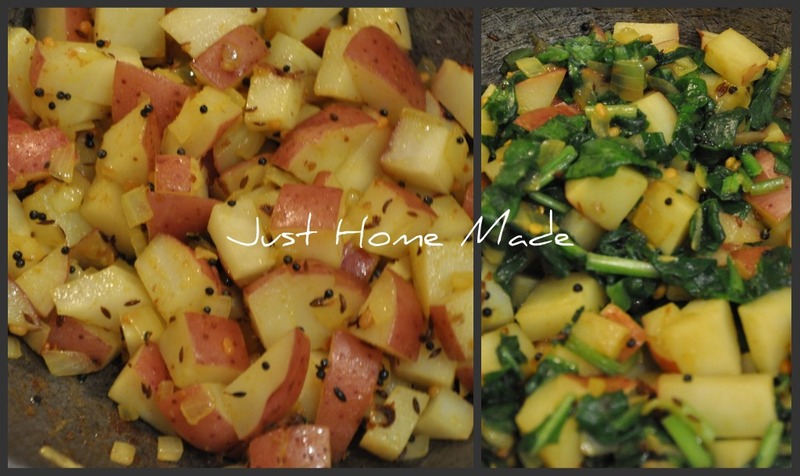 Also, the mix of colors with potato, sauted onions and green spinach make it look very mesmerizing. Veggies love it! I am glad you like it. Yes, it is indeed a yum way of sneaking in Spinach! Can’t wait to try your recipes. After 11 years in London, I love curry! I’m very happy I found your site, and all thanks to Shira’s post.